During my first post-doc in Bern with Cris Kuhlemeier I become interested in plant development. I focused my research on organ positioning at shoot apical meristem called phyllotaxis. Phyllotaxis is among the most conspicuous patterning processes in plants. Interestingly organ positioning is tightly linked to the patterning of vein formation. The expression and polarization of the auxin efflux carrier PIN1 is the earliest marker for both processes, with mathematical models indicating that PIN1 can respond to auxin gradients and/or auxin flux. I used cre/loxP-mediated PIN1 knock-outs as well as cell layer specific complementation of the Arabidopsis thaliana pin1 mutant to examine the interaction between phyllotactic patterning, which occurs primarily in the L1 surface layer of the meristem, and midvein specification in the inner tissues. I managed to show that PIN1 expression in the L1 is sufficient for correct organ positioning, as long as the L1-specific influx carriers are present. Thus, differentiation of inner tissues can proceed without PIN1 or any of the known polar transporters. 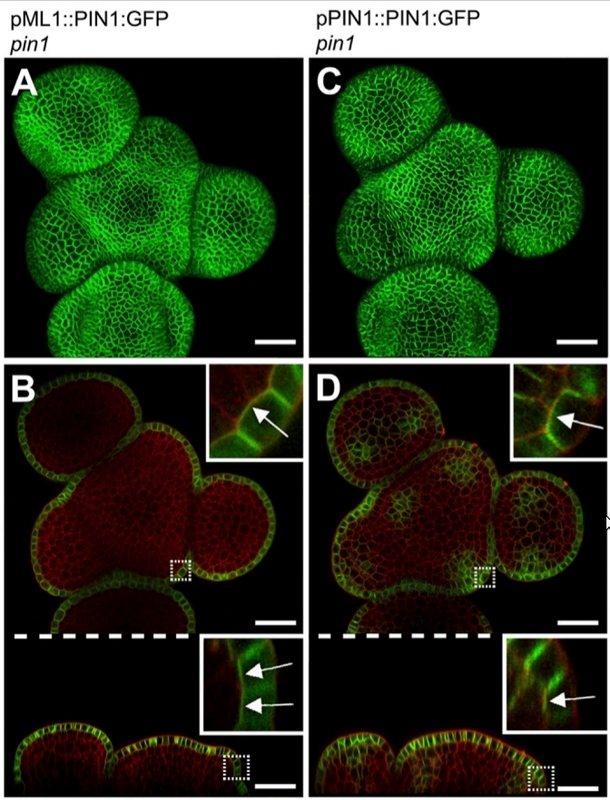 Contrarily loss of PIN1 in the L1 can be partially compensated by upregulation of PIN1 in the sub-epidermal L2 layer, resulting in partial rescue with abnormal phyllotaxis and formation of sterile flowers. On theoretical grounds, this research suggested that canalization of auxin flux between an auxin source and an auxin sink may involve facilitated diffusion rather than polar transport. Developmental Cell 26, 616-628 (2013) Reprint. Plant Physiology 159, 1501-1510 (2012) Reprint. As a side project during my post-doc in Bern I collaborated with Richard Smith group at the Institute. 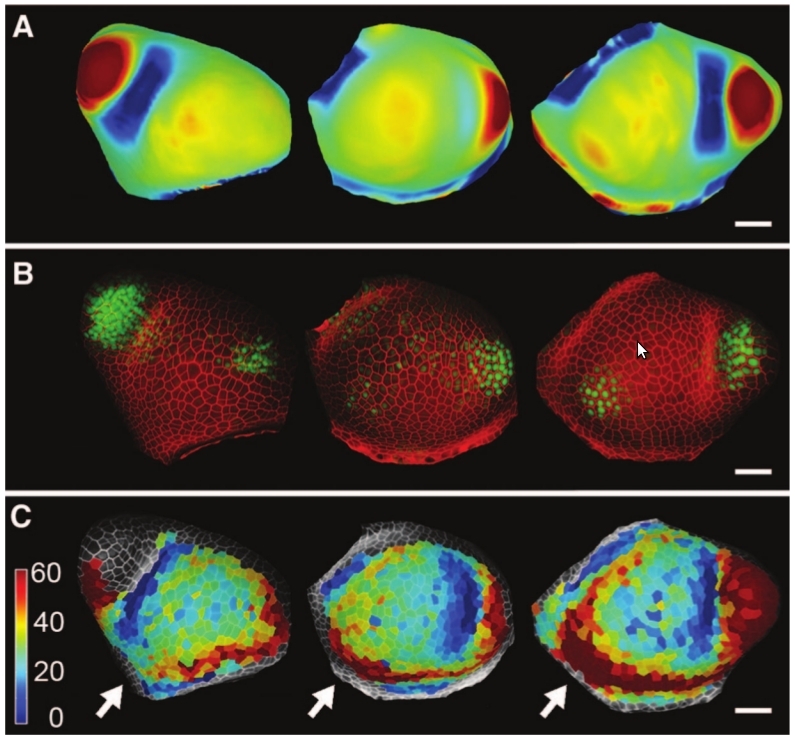 We have taken a highly interdisciplinary approach to understand biomechanics of the shoot apical meristem growth. Elaboration of complex shapes requires changes in the mechanical properties of cells. In plants, the first visible sign of leaf formation is a bulge on the flank of the shoot apical meristem. Bulging results from local relaxation of cell walls, which causes them to yield to internal hydrostatic pressure. By manipulation of tissue tension via osmotic treatments in combination with quantitative live imaging and finite-element modeling, we found that the slow-growing area at the shoot tip is substantially strain-stiffened compared with surrounding fast-growing tissue. We proposed that strain stiffening may limit growth, restricts organ bulging, and may contribute to the meristem’s functional zonation. Thus, mechanical signals seems to not just passive readouts of gene action but may feed back on morphogenesis. Reinhardt D., Kuhlemeier C., and Smith R.S.